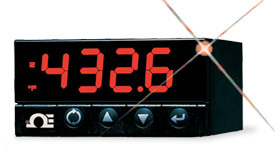 The iS8 series of meter/controllers can measure a wide variety of DC voltage and current inputs, making it suitable for most common load cells, pressure transducers, and strain gauge type transducers. It is the first instrument of its kind, offering a wealth of powerful features and performance in an amazingly compact 1/8 DIN panel mount package. The iS8 handles input ranges of 0-100 mV, 0-1 V, 0-10 V, 0-20 mA (4-20 mA). The iS8 is easy to configure and scale to virtually any engineering units using the push buttons on the front panel, or using a personal computer with the optional serial communications and free configuration software. The serial communications option includes both RS-232 and RS-485 on one instrument, and the straightforward OMEGA ASCII communications protocol, as well as MODBUS protocol. The "-EI" Ethernet option includes a built-in web server, allowing measured values to be viewed on any PC on the network using a standard web browser such as Google Chrome or Microsoft Internet Explorer. The iS8 includes built-in excitation for transducers, selectable as 10 V at 100 mA or 5 V at 60 mA. (Not available with "C24", "C4EI" or "DC" options). The CNiS8 features a choice of two optional outputs: Form C SPDT (single pole double throw) mechanical relays, solid state relays, DC pulse, and programmable analogue output selectable for either a control function or retransmission of the process value. The iS8 features the iSeries programmable tri colour display that can change colours between Green, Amber, and Red at any setpoint or alarm point. Nota: Transducer excitation not available on models with serial communications ("-C24" or "-C4EI") options or low voltage power option ("-DC").